CakeBet Blackjack is a fun online card game that uses Pixi.js and and websockets to create a multiplayer gaming experience. The company’s mission is to connect people in the Bitcoin community through games that run in your browser. The gaming platform sustains 40-50 FPS on a 1440×900 screen even with a low-end Intel graphics card. Along with being able to play with your friends, the game is provably fair. 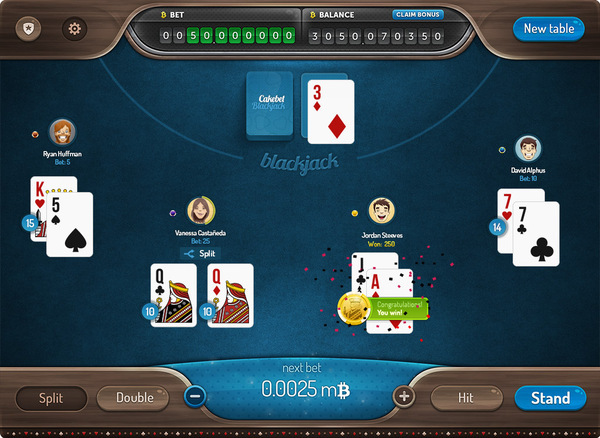 Players can validate each hand while seated at the virtual table. CakeBet works in Chrome, Firefox, Safari, and Internet Explorer. The company plans to release a version that is optimized for mobile browsers in March 2015.